You are here: Home>Blog>Market Hall: What’s the Scaffolding For? The Market Hall, covered in scaffolding. 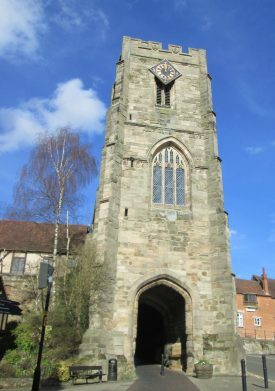 Warwick’s historic Westgate arch. This has ‘grown’ out of the sandstone bedrock, which is naturally exposed beneath the sandstone construction. Image courtesy of Jon Radley. 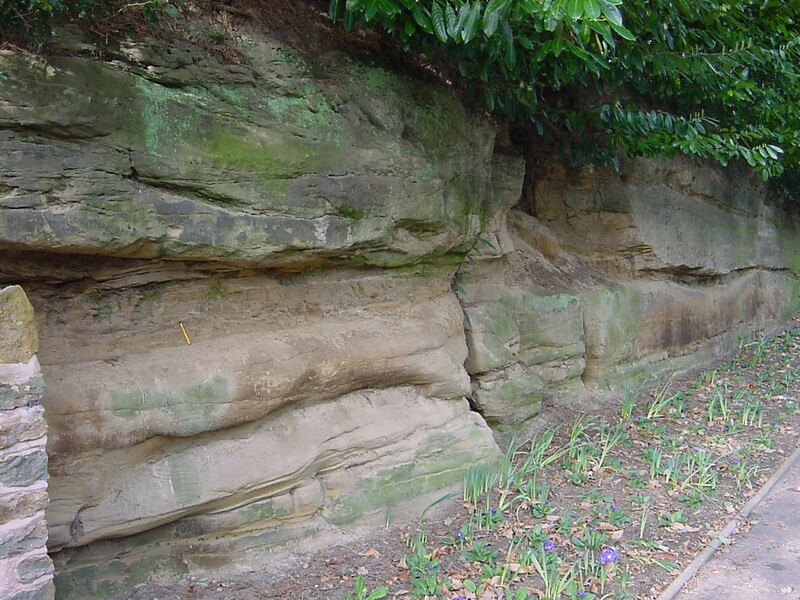 Old face in Triassic sandstone at Blackdown, north-east of Warwick. If you’ve visited Warwick’s Market Place recently you’ll have noticed that the Market Hall is now obscured by some rather hi-tech scaffolding. This is linked to the Our Warwickshire refurbishment, involving the conservation and restoration of the exterior stonework. 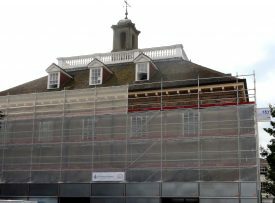 Don’t expect a brand new building when the scaffolding goes – the Market Hall is heavily listed and all exterior works have to be undertaken in a highly ‘sympathetic’ manner, true to the original construction. The Market Hall is one of many older buildings in the centre of Warwick to have been constructed from locally sourced sandstone. This rock can be distinguished from other, relatively far-travelled offerings in the centre of town by its pale, buff colour, and its tendency to weather quite badly, especially on the corners of buildings where it can take on a crumbly and rather dusty appearance. As well as within the Market Hall, the rock can be seen very easily in other 17th century buildings in and around the Market Place – notably The Abbotsford – and within the walls of the Old Gaol along Barrack Street. At Warwick’s heart lies a knoll of sandstone, quarried extensively in and around the town until the 19th century. 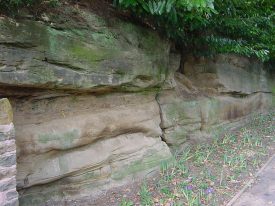 Old quarry faces can still be seen in places, as in Priory Park. There are also a number of cuttings, as within the base of the Westgate Arch, and the approach path to Warwick Castle from Castle Hill. If you know where to look, the natural bedrock peeks out all over the place. I can think of at least six places within a five minute walk from the Market Hall. So what is this rock? Basically it’s a build-up of ancient sand, originally deposited in shallow rivers and on adjacent floodplains, when what we now know as central England was locked up within the hot, semi-arid interior of the Pangaea supercontinent. This time, roughly 245 million years ago, was during the Triassic Period, sandwiched between the most devastating mass extinction that our planet ever suffered and the Jurassic Period, famed for its dinosaurs. Due to continental drift Warwickshire was at a sub-tropical latitude not far north of the equator, and subject to a monsoonal climate. Much of the sand accumulated during the rainy seasons when the local rivers swelled and flooded, and over time formed the layers of sandstone that we see today. As it became buried by younger rock layers the sandstone became cemented, rather weakly, by naturally occurring minerals deposited between the grains by percolating groundwater. On the plus side this meant that the stone could be worked and carved quite easily, but it also means that it weathers quite badly. Today, the local quarries are disused and often overgrown. Stone for restoring sandstone buildings in Warwick is now generally sourced from further afield, but reasonable matches are available. For the current work at the Market Hall, Warwickshire County Council has chosen Hollington Stone from Staffordshire. This is similar in age and character to the Warwick stone, and has a similar watery origin in the subtropical heat of post-apocalyptic Pangaean England. It is slightly redder than the local stone, but shouldn’t stand out too much as reddish sandstones have been used previously for repairs to the Market Hall. A lot can be learnt about Warwick’s watery past by looking closely at the local stone. Wavy layers within the blocks of stone indicate the ebb and flow of the river currents. Fossils found in the old quarries tell us about ancient reptiles and amphibians lurking in the rivers and on their banks. Some of the fossils will feature in the refreshed museum galleries, currently being designed. So next time you take a walk around the town, spare a thought for its quarter billion year-old legacy, and its contribution to local architecture and specifically, our wonderful Market Hall.